Pull the single rod control lever completely backward and lean against back until a desired angle is achieved,and then return the lever to the original middle position to lock at an ideal angle.There are 4 positions with 25º range. A.Hold the lumbar support upwards or downwards to adjust the height of it.The adjustable distance is 3.54". 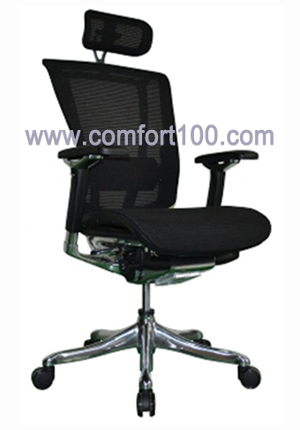 B.Suitable height of the lumbar support would bring more comfort. The best angle could be reached when the arms can rest naturally on the arms pads while working. Forward and backward adjustment: push the arm pads forward or backward to a desired depth.The range for it is about 1.38". Since incorrect seat height contributes to back's fatigue,it is recommended that the angle of knees is slightly less than 90º and feet are level with the floor. Ideal depth is achieved when the upper legs are on the seat,the lumbar area is in touch with the backrest of the chair,and the back of knees does not touch the edge of seat cushion.